Welcome back to Merry Monday! Today I am featuring five beautiful Spring Home Tours that I hope will inspire you as much as they have inspired me! There is something about the first few weeks of Spring that is almost magical. We had a 70 degree day on Saturday and I can’t tell you how happy it made me to see the neighborhood kids playing outside, riding bikes and skateboarding. You could just see how thrilled they were to be able to enjoy a day out of the house. You really do get cabin fever being cooped up all Winter. 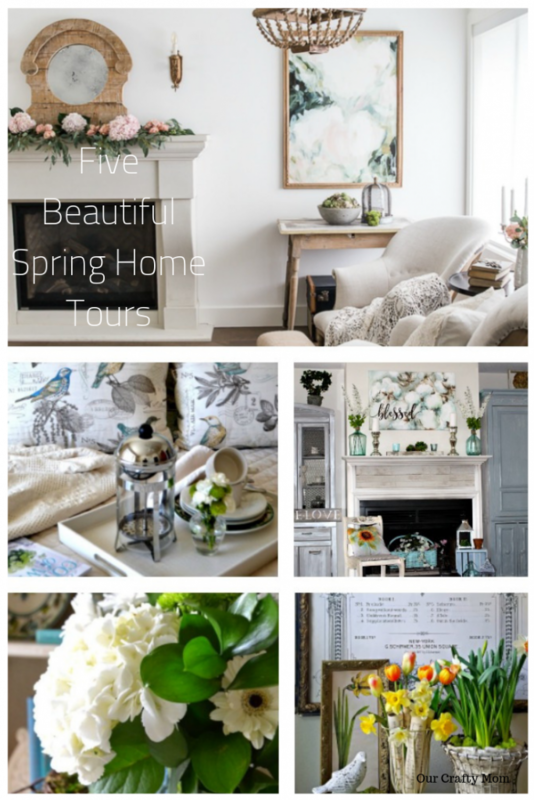 So, when I saw the beautiful Spring Home Tours shared by these super talented bloggers, I couldn’t wait to feature them! What I love most is these decorating ideas are simple enough for you to recreate or use as inspiration to update your own home for Spring. A few pretty flowers, silk or real, ceramic birds, a pretty birds nest. Let’s celebrate the start of Spring and hope that the nice weather is here to stay! Enjoy! Recipes – with tomato, garlic feature, grilled cheese, and egg salads. Spring themed foods. Crafts & Activities – Spring, decor, games, and printables. Thanks for hosting, Michelle! Would love to have you come and link-up at Homestyle Gathering on Tuesdays!